kalamazoo industries youtube channel, stay informed by signing up today. 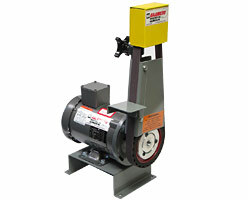 Kalamazoo Industries BG142 1 x 42 industrial belt grinder is a direct drive unit that travels 5400 SFPM to remove metal quickly with minimal heat buildup. This custom grinder was designed to meet a customer’s grinding needs and now is a part of our standard belt grinding equipment. The Kalamazoo Industries BG142 1 x 42 industrial belt grinder features a 6” x 1” serrated 70 duro contact wheel, 1/2HP 1PH 110V motor, removable work table and platen. BG142 1″ x 42″ belt grinder is being use in the following industries: Energy, oil/natural gas, petro/chemical, knife manufacturing, automotive, metal foundries, agriculture, as well as many other manufacturing and fabrication environments. Kalamazoo Industries BG142 1″ x 42″ blog/press release. Kalamazoo Industries BG142 cut sheet. Kalamazoo Industries BG142 Parts list.